TAUNTON, Mass. 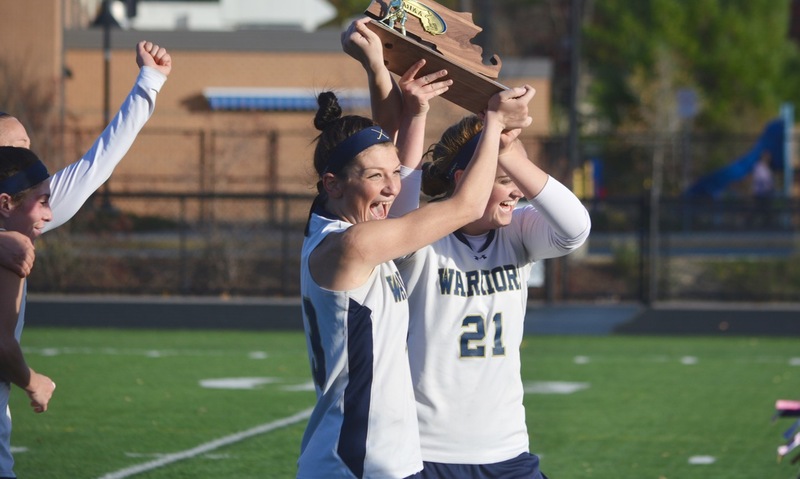 – Defense has been the strength for Foxboro all season long (with only 11 goals allowed in the first 21 games), helping the Warriors win the Davenport division title and then reach the program’s first sectional final on Saturday afternoon at Taunton’s Tiger Aleixo Stadium. In the Div. 2 South final, the defense stood tall again, led by seniors Kelly Fisher and Angela Vandenboom, limiting Falmouth to only one corner and one shot over 60 minutes. Thanks to the defensive effort in front of her, junior goalie Kelli McCarthy was not forced to make a single save, as Foxboro pulled out a 2-0 victory to win the program’s first ever Div. 2 South championship. While Falmouth did not get a shot on target, the Clippers did have possession in the attacking zone for stretches of the game. The Warriors stayed compact around the circle and kept everything to the outside. In addition to the defenders, Foxboro midfielders Meghan Curran, Catherine Luciano, Jaclyn Brion, and Allison Curran were always on hand to close down potential scoring chances. Foxboro was also dangerous in the attack in the first half, creating a number of chances, including four corners. The first opportunity came in the sixth minute when Sophia DiCenso had two shots a few yards from goal but the first was cleared by Falmouth goalie Molly Duff-Still and the second bounced off the foot of Lily Daly at the back post. It started from a quick transition, Meredith Cronin hitting Emma Daly with an outlet pass to spring the attack. A few minutes later, another quick break had Foxboro racing forward with Meghan Curran hitting Daly on the run but her shot was kicked off the line by Duff-Still before it could trickle across. The opening goal felt imminent and in the 16th minute the Warriors made the breakthrough. Fisher’s shot off a corner was blocked but the ball caromed right back to her stick. She sent in a second shot that was settled by DiCenso right in front of goal. The sophomore turned and slid the ball past the goalie for a 1-0 lead. In the 25th minute, Foxboro had a chance to double the lead. Caroline Wheatley started the break with a pass to Luciano, who fed the ball to Jenna Stamatov and on to Lily Daly one-on-one with the goalie, but Duff-Still came up with her fourth save of the first half. With just under two minutes left in the half, Foxboro did get a second. Again it came off a corner and a hit by Fisher from the edge of the circle. Wheatley was stationed in front and cleverly lifted the ball up over the pads of the goalie for a 2-0 advantage that felt like game over to many, but not to Bordieri. In the second half, Foxboro went into a defensive shell, keeping Falmouth to the edges of the attacking zone and it led to very few scoring opportunities for either team. The lone clear chance fell to Daly just four minutes after the break when she tipped a Cronin shot at close range but Falmouth’s Chloe Crago was able to get across and clear it off the line. With five minutes remaining, Falmouth finally got a decent look at goal, but the shot went off the side of the net. The final minutes ticked off the clock and the Warriors stormed onto the field to celebrate their first title. Bordieri is in her 15th year in charge of the program and was clearly savoring the moment of winning a trophy. “Fifteen years…it’s been a long time coming,” she said. “We’ve come close to doing great things for a long time, so to have this is just an amazing feeling. Foxboro (19-2-1) will advance to the Div. 2 state semifinal on Tuesday at Reading High and will face undefeated North champion Watertown, which is riding a national record win streak of 182 games over the past eight seasons. MANSFIELD, Mass. – Each time Foxboro took the lead on Thursday afternoon, Mansfield bounced right back with the tying goal. And each time it was the Hornets No. 4 that got the telling touch to swing momentum back to the hosts. 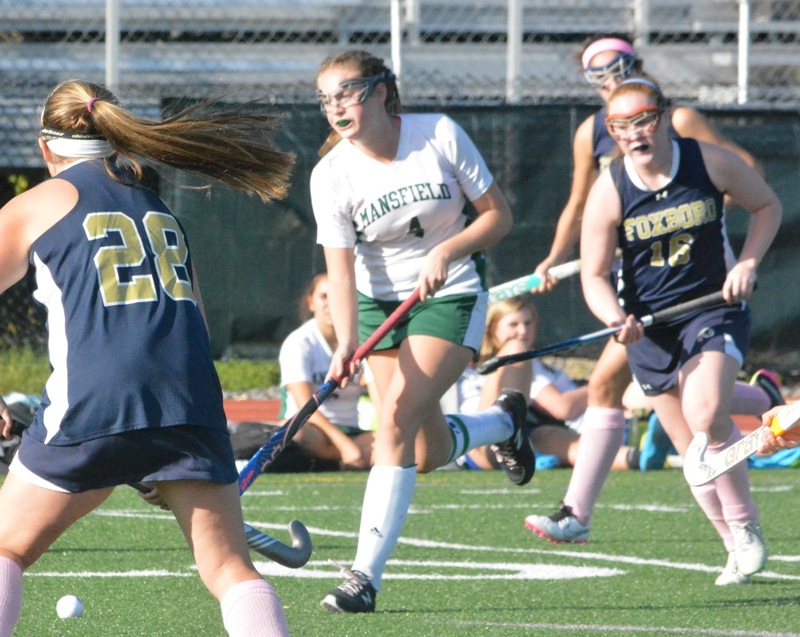 Senior Caroline Maher scored all four of Mansfield’s goals in a 4-3 win over the Warriors at Alumni Field and in the process clinched tournament qualification for the Hornets (9-1-0, 8-1-0). Foxboro took the lead with 18:54 remaining in the first half. 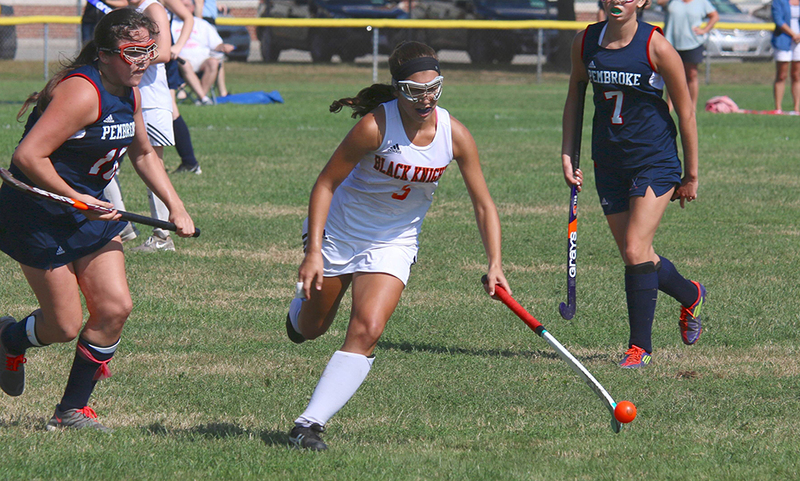 Sophia Dicenso assisted on a goal by Caroline Wheatley to put the visitors ahead. Only 1:56 later and it was tied. Maher took a feed from Julia Todesco and finished. Dicenso pounced on a chance in front of goal with 6:35 remaining in the opening half to again give the visitors momentum but just 4:15 later Maher once again found space in the middle of the Warriors defense to tie it up. Maher would add two more goal in the second half, one at 26:35 off a corner from Emily Lerardo and the other at 15:44 from Olivia Horn, to build the Mansfield lead to 4-2 and put the Hornets in command. When asked what made Maher such a scoring threat, Mansfield coach Theresa Nyhan responded, “She is a bull in a china shop. She’s tenacious. She’s a playmaker and a finisher…she’s able to do both and that’s what separates her from the others. The game’s momentum swung on Maher’s second that tied the game heading into hafltime. It was a pivotal moment with the Hornets on the edge but the Warriors unable to press their advantage. “As soon as you get the momentum, you have to keep going and kudos to them for keeping going forward and not falling back,” said Bordieri. The Hornets have shown the ability to bounce back at several points this season and Nyhan believes that her team has confidence when faced with adversity that it can find a way to get back into a game. The Warriors also showed resiliency on Thursday. Despite falling behind by two goals, Foxboro continued to push forward and won a corner that Annie McGeary fed out top to MaryLou Long and she blasted it past the defense and goalie Brenna Prior to cut the lead to 4-3 with 11:41 remaining. Mansfield hung on for the one-goal victory that clinched the necessary 18 points to reach the state tournament and also kept the Hornets within one game of league leading Franklin with a rematch just 12 days away. Before Mansfield can try and get revenge against the Panthers, the Hornets will face Sharon on Tuesday. Foxboro (5-4-2, 4-4-2) will travel to Pembroke on Monday morning.